Azam Nemati writes: I bought this album today from the local Iranian restaurant here in Florida and I was so overwhelmed (I sobbed) by the beautiful lyrics and music which is reminiscing of old Khuzestani songs. 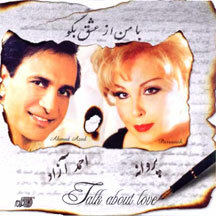 Ahamd Azad has been singing since the 1980s however, in this album he has truly developed his style. I love everything about this album, the beautiful combination of different elements of music, the lyrics as well as the beautiful and versatile voice of Parvaneh. If you have been lucky enough to experience love in its most romantic form then you will love this album. "Shabhaye Karoon" will stir so much emotion you will feel your heart overflowing with longing for Iran. You will be singing all the songs by heart. I wish more albums like this will be coming out of LA!